BVC had been asked to assist with the collection and containment of a Desiccant material used at a nuclear power generation site.Contained within a vault several meters underground, the desiccant was to be drawn out and up over a distance of some 20-25 meters. Furthermore there was an ATEX zone 22 and contamination concern. The product was to be discharged into 200 litre drums. For this specific application our Flagship Centurion ATEX rated zone 22, BVC Ti80 7.5Kw 3 phase unit was offered. 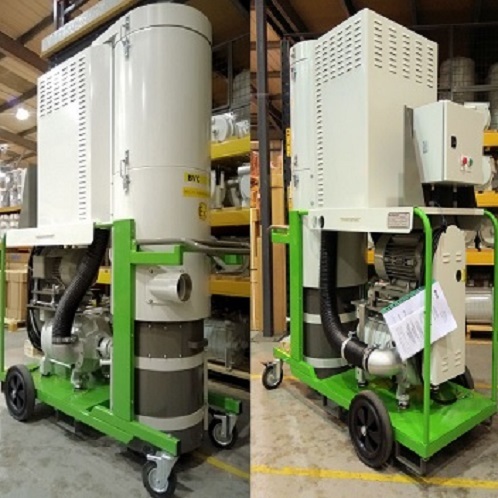 Quirepace manufactured a special stainless-steel cyclone interceptor head designed to be placed on to the 200 litre drums for product collection. With a flow rate of 191 litres of air per second, the BVC Centurion TI80 was easily able to move the product from the vault to the collection interceptor drum. The unique filter design enables air to flow at these rates through the machine whilst offering very high levels of protection and filtering. The large surface area clearflow filter permits excellent air flow whilst trapping dust. The H14 HEPA filter then offers filtering and protection collecting 99.995% of debris at MPPS (Maximum Penetrating Particle Size). The customer also wanted to recycle / capture the exhaust air into their own air filtration system. BVC were able to accomplish this due to our unique exhauster blower design. A manifold was attached to the exhauster exhaust port enabling a hose to be fitted between the vacuum and their air recycling system.